Could it be? A non-PowerShell related blog post? A while ago, Mark Baggett (@MarkBaggett) tipped me off to a technique that he had seen malware using in the wild. He explained that if you could manage to execute an unsigned binary with the same name as a signed binary (but with trailing white space) that it would take on the code signature of the legitimate binary. I was obviously intrigued. This posed a bit of a challenge though because Windows automatically strips trailing white space from file names. I eventually figured out how to bypass this slight restriction by echoing the contents of my binary using `type` to a path prefixed with \\?\. type evil.exe > "\\?\C:\Windows\System32\calc.exe "
Great. We now have an unsigned binary with trailing white space. Now how does one execute it? 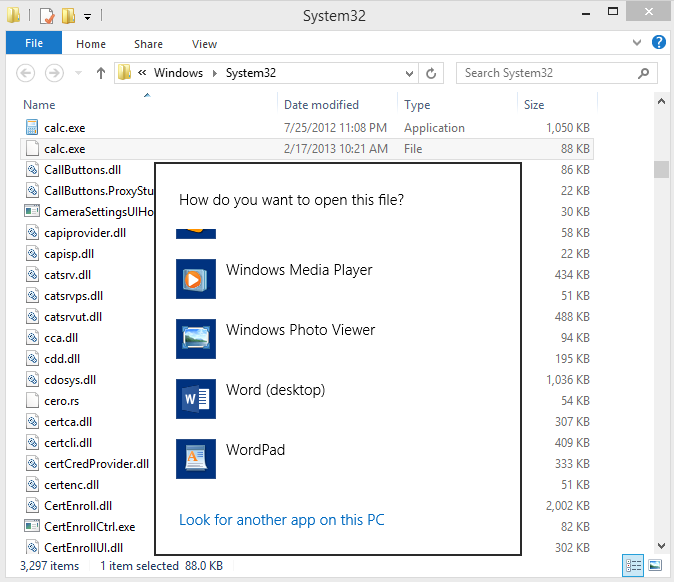 As is demonstrated by the following screenshot, there is no longer a file association with the binary and Windows doesn't know how to load it. The unsigned binary is a .NET executable. The original calc is not. The unsigned binary is lacking the company name of "Microsoft Corporation". I tried to replicate the company name by modifying the assembly information of my unsigned binary but it caused Process Explorer to no longer say that it was '(Verified) Microsoft Windows'. Another peculiarity I witnessed was that depending upon how you referenced the file names, the hash of the unsigned binary differed. Its true hash would only be manifested by referring to its 8.3 file name. All in all, I would consider this technique to be more of a novelty than a serious vulnerability. For example, sigcheck detects the unsigned binary. Also, if code integrity checks are enforced (as Windows RT does), the kernel will prevent the unsigned binary from being executed. The underlying logic flaw is that Microsoft made the assumption that an executable would not have any trailing white space. As a result, the file information of the original executable (with no trailing white space) is processed rather than that of the one with trailing white space. You can download the binary I used in the screenshots here. 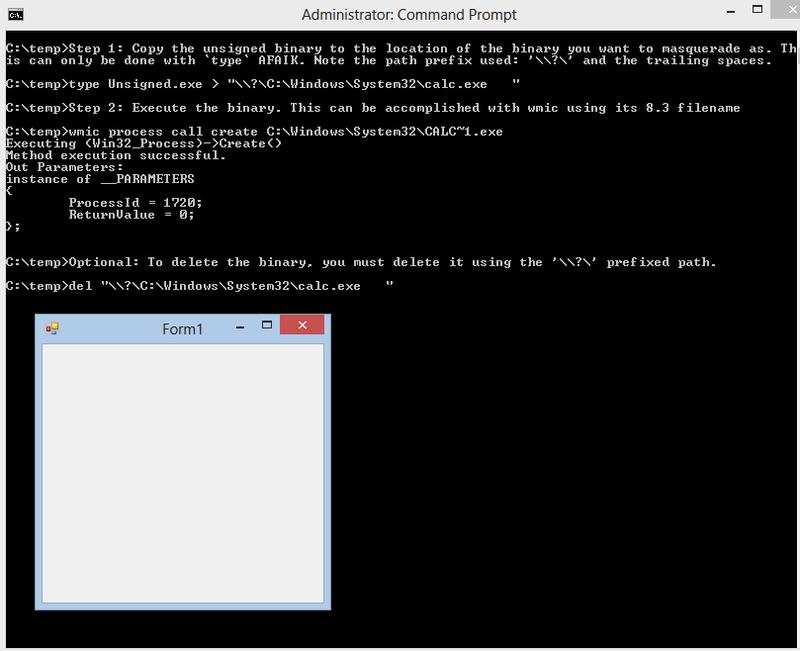 All it is is a basic Windows Forms .NET executable with the calc.exe icon and assembly information. My thoughts exactly. I wanted to test it out on AppLocker but it doesn't work on Windows 8 Pro. When I say it doesn't work, you can configure rules and test them but it won't actually enforce them. You need WIndows 8 Enterprise. Grrr. I'll have to see if this will bypass SRP though. don't know if it makes any difference that I choose some 3rd party app instead of window's application such as calc.exe? 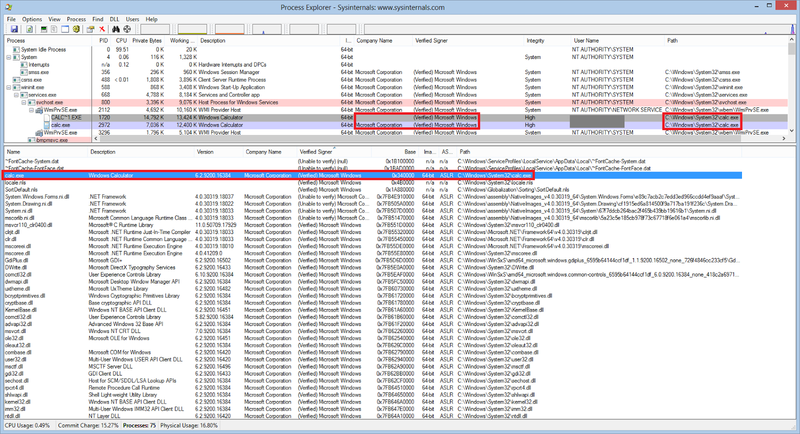 Tested on AppLocker on Windows 7 Ultimate and, as expected, the correct executable (evil.exe / calc~1.exe) is detected. The event log records shows however \windows\system32\calc.exe as file name, but what else could it show? same deal on createProcess i get retvalue 9. This is on Server 2008 R2 to test SRP bypass - what OS did you run this on successfully?